February 6 – Gianni Infantino will rule FIFA for at least four more years after it was confirmed, as anticipated, that he will stand unopposed in June’s presidential election. FIFA confirmed that only Infantino had the required nomination letters from five of the organisation’s 211 member federations when the deadline passed at midnight in Zurich. 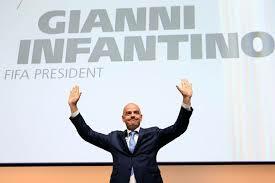 “Following the call for election issued by the FIFA Council on 10 June 2018, FIFA’s member associations have proposed, in due time and form, the following candidate for the presidential election to take place at the 69th FIFA Congress in Paris on 5 June 2019: Mr Gianni Infantino,” it said in a statement. Infantino must now pass eligibility and integrity checks for the election in Paris but that will most likely be a formality despite all manner of question marks over the way FIFA has been run since he took over from Sepp Blatter three years ago promising to restore the organisation’s credibility after the dark days of scandal and skullduggery. In the weeks leading up to the deadline for candidates, former Swiss international Ramon Vega, who at one point considered running for FIFA president last time out, had appeared on the scene as a potential rival to Infantino. In a series of interviews with InsideWorldFootball, Vega said he spoke for many when he questioned the direction of FIFA was heading under Infantino, expressing his concern at the lack of accountability and financial transparency and the heavy handed role of the FIFA executive in the ‘management’ of member associations. Vega had flown to Rome, where the UEFA Congress takes place Thursday, to try and harness enough backing to launch an official challenge and ensure a democratic election process. But despite exploring the mood and tone among football’s movers and shakers, he ultimately failed to secure the five nominations needed. Critics of Infantino, who has not revealed his five nominees, raise the point that he owes his candidacy simply to opportunism and the fact that his former boss and UEFA president Michel Platini was banned from football along with Blatter for ethics violations. Intriguingly, he will be present, as protocol dictates, at UEFA’s Congress in Rome where his $25 billion plans to change the landscape of world football with a new expanded Club World Cup and a global Nations League tournament seem highly likely to be discussed behind the scenes, having put him at loggerheads with many European federations. That said and despite all the reservations about his modus operandi, nothing has worked more in Infantino’s favour than his pledges to members of massively increased development funding, a strategy that has tightened his grip on the top job and has made next June’s election more of a coronation.